06 Şubat 2019 Çarşamba 09:01 - 21 reads. "Sweden – take the sami rights seriously"
"Amnesty: the Government is tiger, when the UN criticizes"
"the DEBATE. Today, 6 February, the sami national day. A new government is in place after months of negotiations and the new ministers have samefrågorna on his table. And today we ask the question to these ministers: this is the government finally going to take urfolksfrågorna and Sweden's international human rights commitments seriously? " "For now it is enough. Sweden was one of the driving countries behind the main binding urfolksrättsliga convention of human rights, the ILO convention 169, which entered into force in 1991. Sweden also endorsed the UN urfolksdeklaration, another key international urfolksdokument adopted by the UN general assembly in 2007. In international development cooperation, Sweden has a high prestigious for the urfolkens land and water rights, not least through the new institute in Stockholm, which focuses precisely on these issues, the Tenure Facility. " "But at home it looks different. " "Since 2011, recognised the sami as an indigenous people in Sweden's constitution. But Sweden has not yet, 30 years after it was created, a party to the convention that we were about to drive forward, the ILO 169. And the Nordic sami convention, a joint nordic agreement to ensure the sami people's right to self-determination over their economic, social and cultural development, has still not arrived in the port in spite of long negotiations. " "Investigation after investigation about the Swedish samepolitik and increased influence have been added, completed and put on high. Since the nineties, the government representatives stated that Sweden “urgently” prepare a ratification of the ILO convention – but we see no sign that we are closer to a ratification now than we were in 1991." 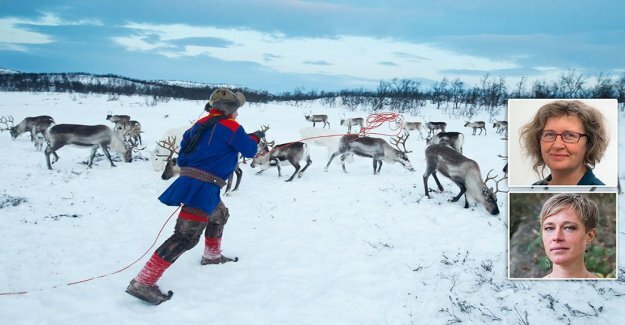 "By all accounts is the resistance in the first hand of the sami people's land rights, and the major economic interests in natural resources in Sápmi. For nine of the ten proposed mines are located in the renbetesland, as well as the vast majority of planned wind farms. Both mining and quarrying as wind turbines have major impacts on reindeer husbandry and other sami industries, as well as the sami culture at large. Sami representatives believe that it is a matter of life or death." "The international criticism of Sweden's handling of its indigenous people has, in recent years have not been gracious. Criticism is not the least if the people the right to influence and co-determination rights over their traditional land. At the same time, litigation on the sami right to land, hunting and fishing, and these river up strong feelings and are likely to increase tensions in local communities. Several controversial gruvärenden, including the much talked about plans for a mine in Gállok, long ago, at the government's table." "And what makes the Swedish management? Answer with silence. What the government is saying, when the united nations or the council of europe criticises Sweden for violations of internationally recognized urfolksrätt? Answer with silence. " "What says the prime minister when Swedish newspaper svenska Dagbladet asks questions of sami land rights, when the minister of economic affairs and the minister of culture, gives completely different information about the sami and the right to influence, or when the attorney general blames the Swedish government to duck responsibility, and of such double standards? Jo: he responds with silence." "Now it is enough. It is time for the government to ensure the sami's right to influence, land, water, culture and survival. Therefore, Amnesty, on the sami national day, the question to the new government: when can we expect you to start taking urfolksrätten seriously in Sweden?" "nAnna Lindenfors, secretary-general of Amnesty International in SverigenJohanna Westeson, legal adviser and expert to discrimination Amnesty International in Sweden"